I don’t listen to the radio much these days because usually I have my phone plugged in to play pandora or a podcast/audio book, but I happened to be listening to the actual radio over the weekend and heard an ad that simultaneously broke my heart and infuriated me. Maybe you’ve heard it too? It was two women talking about putting margarine on kale to make it taste better. I honestly missed the first half because I wasn’t paying much attention until I heard the phrase “punishment kale”. My ears perked up at that expression! The rest of the ad was talking about how the woman punishing herself should put margarine on her kale because it tastes “just like butter” with less calories or some nonsense like that. 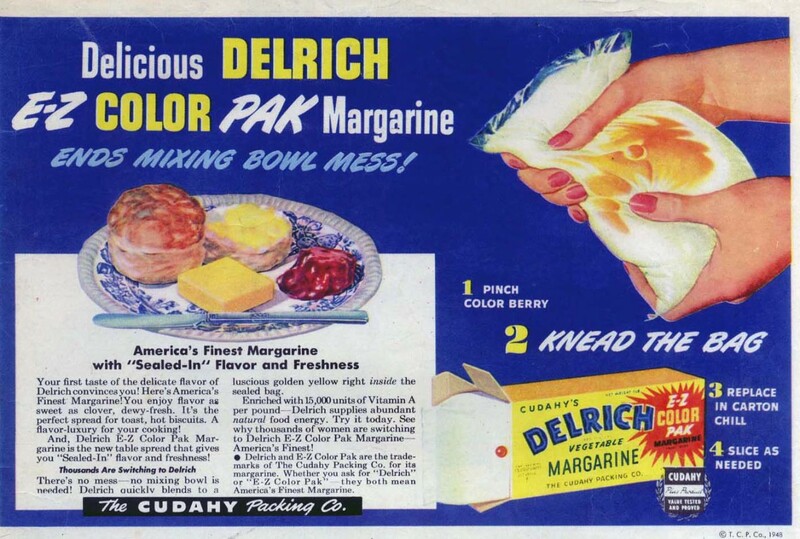 Basically, the ad promoted margarine as a healthy alternative to butter for those days when you’re forcing yourself to eat vegetables as some sort of punishment for whatever it is you think you did that deserves punishing. Leave a comment and let me know if you know the commercial I’m talking about, and if you haven’t heard it yet, keep reading because what I have to say applies to everyone! This commercial offended me on two levels, so lets break it down one at at time. Offense #1 – Why are we punishing ourselves with kale? The premise of this ad, whether it was meant to be a joke or not, is exactly what’s wrong with mainstream health/diet culture today. Food is NOT a punishment. It’s just food. You’re not bad for eating too many cookies, and you’re not good for choking down a boring kale salad. Can we please stop? Aren’t you tired of feeling the constant need to be “good” and justify what you eat? Because I am. There are, of course, foods that will make you feel better or worse depending on your body and digestive system, but you’re not a bad person because sometimes you eat food that doesn’t agree with you. You’re just a person who makes choices. This is perfect timing with Thanksgiving this week, which is notoriously the day in which we all over indulge and then punish ourselves with diet and exercise. I dare you to look at Thanksgiving as just another day. Choose to eat whatever foods you want; whatever foods make you happy or feel good, and then move on with your damn life. Don’t punish yourself with vegetables you hate because you had an extra slice of pie when you got home from Aunt Mary’s house. It’s just a piece of pie, y’all. I have great news for you: there are fat soluble vitamins in most vegetables! That means that we actually need health forms of fat (i.e. butter, olive oil, avocados, etc.) to be able to properly digest and absorb key nutrients like vitamins A, D, E, and K! So if you’re going to eat kale because you actually enjoy it, you want to be putting some grass fed butter or ghee on there to get the most out of your veggies! I also need to point out that margarine and hydrogenated oils are so, so, SO bad for you. If you remove one thing from your diet, make it hydrogenated oils and trans fats. Really. The process used for hydrogenating oils is so destructive it actually changes the fat on a cellular level, so it’s already damaged by the time it reaches the grocery store shelves. (fun fact: same goes for vegetable oils) Did you know that margarine was made popular in the 1940’s and 1930’s because it was a cheap replacement for real butter during the war? It’s so processed that at the time it came with a packet of yellow food dye to turn it from white to yellow so that customers would find it more appealing. If you have issues with lactose, try making or buying ghee. It’s a clarified butter that has no lactose in it because the milk solids are filtered out, which means it’s much easier to digest. Enjoy your life and your food. Eat kale if you want to, or don’t, that’s fine too. And for the love of God put down the margarine!